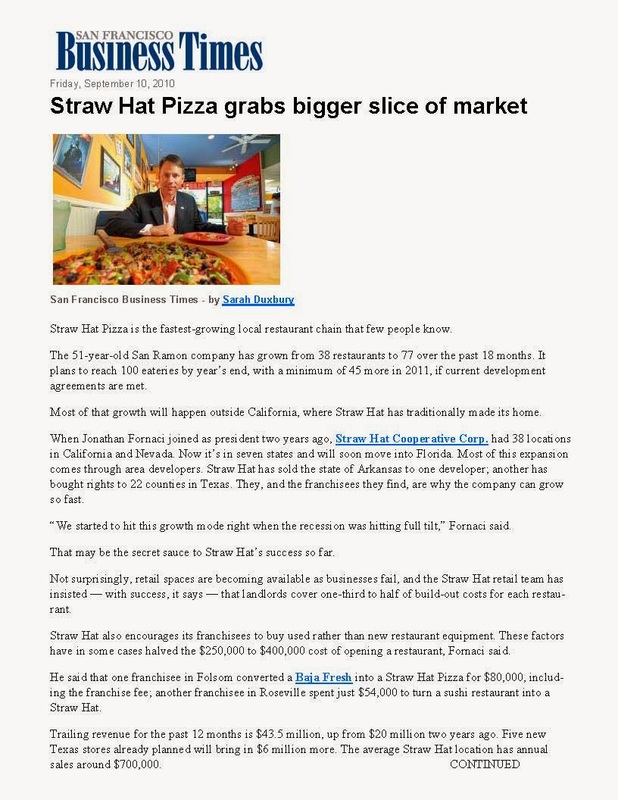 Straw Hat Pizza is the fastest-growing local restaurant chain that few people know. The 51-year-old San Ramon company has grown from 38 restaurants to 77 over the past 18 months. It plans to reach 100 eateries by year’s end, with a minimum of 45 more in 2011, if current development agreements are met. Most of that growth will happen outside California, where Straw Hat has traditionally made its home. When Jonathan Fornaci joined as president two years ago, Straw Hat Cooperative Corp. had 38 locations in California and Nevada. Now it’s in seven states and will soon move into Florida. Most of this expansion comes through area developers. Straw Hat has sold the state of Arkansas to one developer; another has bought rights to 22 counties in Texas. They, and the franchisees they find, are why the company can grow so fast. “We started to hit this growth mode right when the recession was hitting full tilt,” Fornaci said. That may be the secret sauce to Straw Hat’s success so far. Not surprisingly, retail spaces are becoming available as businesses fail, and the Straw Hat retail team has insisted — with success, it says — that landlords cover one-third to half of build-out costs for each restaurant. Straw Hat also encourages its franchisees to buy used rather than new restaurant equipment. These factors have in some cases halved the $250,000 to $400,000 cost of opening a restaurant, Fornaci said. 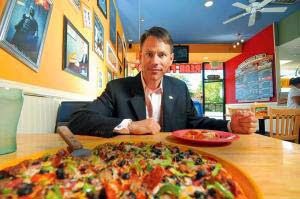 He said that one franchisee in Folsom converted a Baja Fresh into a Straw Hat Pizza for $80,000, including the franchise fee; another franchisee in Roseville spent just $54,000 to turn a sushi restaurant into a Straw Hat. Trailing revenue for the past 12 months is $43.5 million, up from $20 million two years ago. Five new Texas stores already planned will bring in $6 million more. The average Straw Hat location has annual sales around $700,000. At one point, there were 450 Straw Hat Pizzas in California alone. 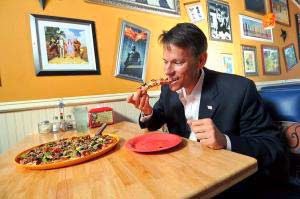 Marriott Corp., the owner then, decided to sell the chain to Pizza Hut, which is how Pizza Hut entered the West Coast in the mid 1980s. But a few Straw Hat owners didn’t want to convert to Pizza Hut, so the brand struggled on. About two years ago, remaining Straw Hat owners decided they wanted the brand to grow again. They brought in Fornaci to do just that — to hire an executive team, develop franchising standards and sell new stores. The company did a private placement a year ago and now has about 250 investors, none with more than a 3 percent ownership, Fornaci said. Darren Tristano, an executive vice president at Technomic, said that franchising lowers risk for the chains while also reducing capital expenditures, making it an attractive way to grow in a recession. “It’s a great opportunity for chains of a smaller size to grow very quickly, and as a result has become very trendy,” Tristano added. Straw Hat is currently No. 447 on Technomic’s list of the country’s 500 largest chains, based on sales. Though pizza sales are trending up after a bad 2009, Straw Hat is adding a frozen yogurt concept it created and calls Tower 27 Yogurt. The first opens in Walnut Creek in three weeks, and all California Straw Hats will undergo a $25,000 retrofit to add the yogurt shop. Yogurt has pretty sweet margins — the cost of food is about 15 percent of the sale price. 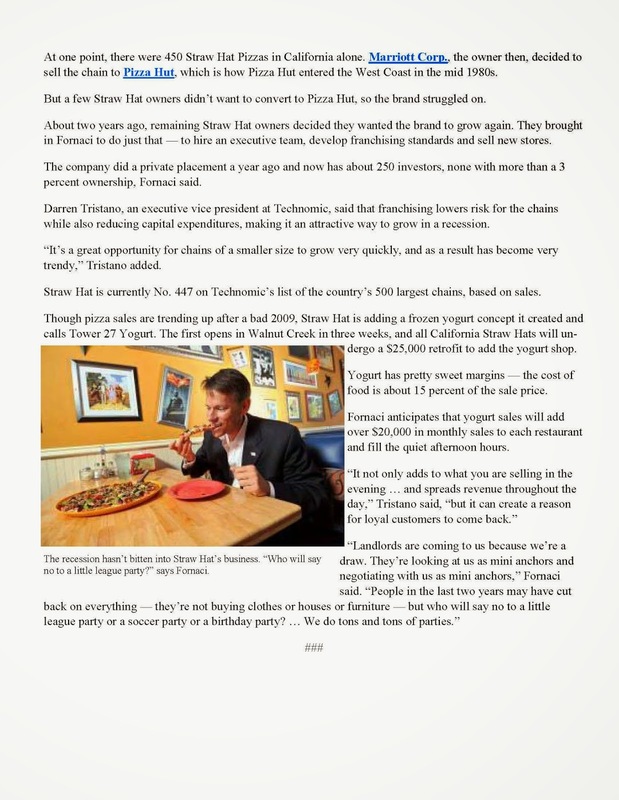 Fornaci anticipates that yogurt sales will add over $20,000 in monthly sales to each restaurant and fill the quiet afternoon hours.